The beach of Vythisma or Vithisma on the island of Alonissos in Greece, information and pictures. Vythisma or Vithisma is an isolated and very nice sandy beach in the south of the island of Alonissos, between Marpounta and Megalos Mourtias Beach. The easiest way to get there is by boat and it is always quiet and peaceful. Don't forget to take some water and snacks with you, because there is no tavern or snack bar and there are no other facilities (also no rental of umbrellas and sunbeds). There are pine trees around the beach for the people wanting to lie in the shade. If you do not want or you cannot visit the beach by boat, you take the road to Marpounta Beach and watch out untill you see the sign that points to the beach of Megalas Mourtias. The path to Vythisma Beach starts here as well, but be warned: it is quite steep and sometimes it's quite difficult to see what direction it is going. 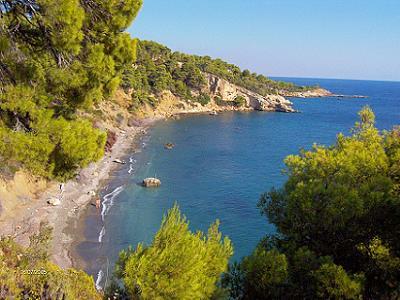 The beach of Vythisma is one of the best sandy beaches of Alonissos and consists of sand and small black pebbles. The waters here have a beautiful turqoise colour.